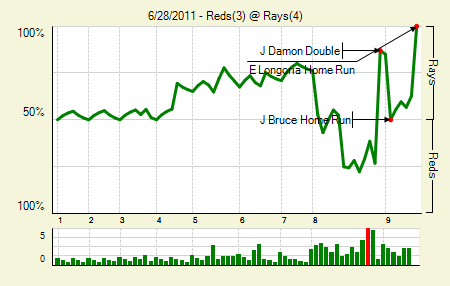 Moving the Needle: Johnny Damon puts the Rays ahead in the eighth with a two-RBI double, +.602 WPA. Until the bottom of the ninth, Johnny Damon had done it all for the Rays. He opened up the scoring with a solo home run, which held up until the Reds got two in the eighth. Now down 2-1, the Rays put runners on first and second for Damon, who blooped one to shallow left. Chris Heisey went for the dive, but it ricocheted off his glove, allowing both runners to score. Jay Bruce then answered with a game-tying homer to lead off the ninth, but Evan Longoria felt he had something to prove and hit his own homer, the game-winner, to lead off the bottom half. David Price: 7.2 IP, 6 H, 2 R, 1 BB, 12 K. He was really rolling until the eighth. The Reds got half their hits and all their runs off him that inning. Johnny Cueto: 7.2 IP, 4 H, 3 R, 1 BB, 6 K. A bloop double ruined everything. 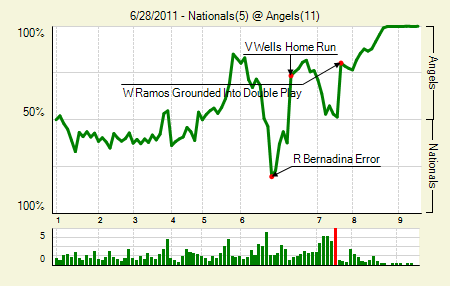 Moving the Needle: Vernon Wells puts the Angels ahead in the sixth with a two-run shot, +.359 WPA. It was quite a day for Wells, who went 4 for 5 with a double and a homer. He scored three times and also drove in two, both on a homer off Collin Balester in the bottom of the sixth, which capped a crazy inning. The Nationals started by putting up four runs in the top half, but the Angels got a leadoff homer from Erick Aybar in the bottom half. Torii Hunter followed with a single, and two batters later Wells popped one over the fence in left. They threatened for more but were denied, though they did put up a five-spot in the eighth. Mark Trumbo: 2 for 5, 1 2B. He drove in three runs. Laynce Nix: 4 for 4, 1 HR. I did not expect to see a .249 ISO on Nix, though he was close to that mark through around 300 PA in 2009. 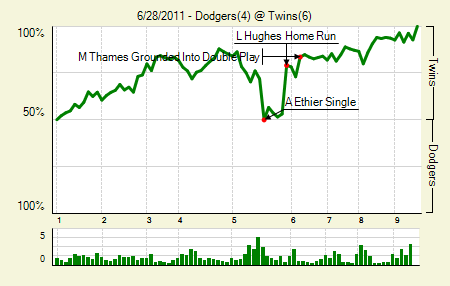 Hi last four-hit game came on April 23, 2005. 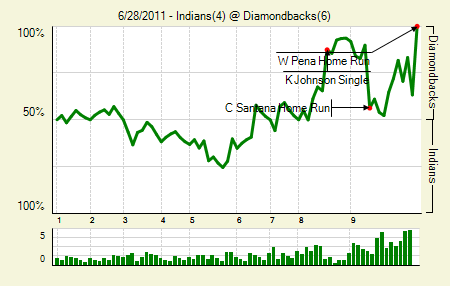 Moving the Needle: Wily Mo Pena walks off with a homer in the ninth, +.367 WPA. With the game tied 2-2 in the eighth, the Diamondbacks rallied for a pair and handed the lead to their closer, J.J. Putz. He walked the leadoff man, always an ominous sign in the eyes of a broadcaster. Two batters later Carlos Santana tied the game with a no-doubt blast deep down the right field line. Though Putz was pulled before finishing the inning, the Diamondbacks went into the ninth with the score still tied. Then they got a leadoff walk, and three batters later Pena lined a low pitch over the wall in left to end it. How about the timing on that call-up? Pena is 6 for 25, but three of those hits have been homers (.240/.240/.600). Daniel Hudson: 8 IP, 6 H, 2 R, 1 BB, 5 K. His FIP is down to 2.70 thanks to a nearly nonexistent home run rate. Josh Tomlin: 7 IP, 5 H, 2 R, 0 BB, 4 K. He did allow a homer, his 14th of the year. Moving the Needle: Mark Hamilton starts the second-inning scoring carousel, +.105 WPA. The Cardinals struck with singles early and power later. In the second they put two men on with a single and a walk, and then got three straight singles to open up a 3-0 lead. Hamilton’s came first, and it was nothing fancy: just a clean grounder past second. Nick Punto and Ryan Theriot followed with singles of their own to cap the scoring. A triple and a pair of homers later in the game added to the lead. Kyle Lohse: 5 IP, 4 H, 0 R, 1 BB, 2 K. Rain limited him to five innings on 69 pitches. Colby Rasmus: 1 for 3, 1 HR, 1 BB. He scored twice. The homer was of the solo variety. Moving the Needle: Carlos Pena homers to put the Cubs on the board, +.149 WPA. They scored nine runs in the first two and a half innings of this one, with the Giants providing the bulk of the production. 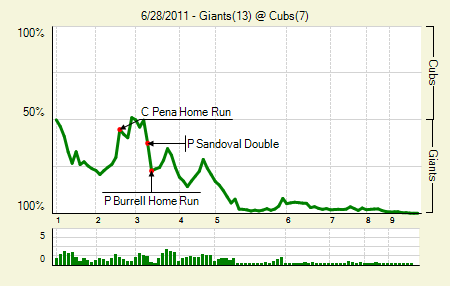 In the second the Cubs answered the Giants’ three runs from the first. Pena’s homer came first, a two-run shot that made it 3-2 Giants. Koyie Hill then tied it with a solo shot. The Giants wasted no time in taking the lead back, though, as they got a walk, a double, and a homer in the third before really breaking the game open with a five-spot in the fifth. Miguel Tejada: 3 for 6, 1 HR. When someone hitting this poorly does this well it’s always notable. Pat Burrell: 3 for 5, 1 HR. HE drove in three and scored twice. That’s only his second homer since April 18th. 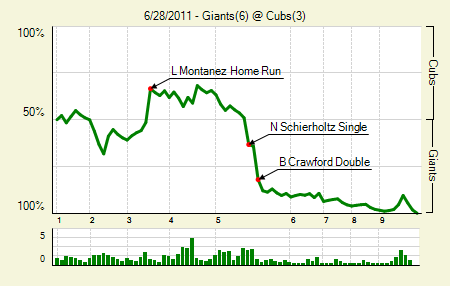 Moving the Needle: Lou Montanez homers and puts the Cubs ahead, +.181 WPA. That’s another Giants win with a Cub having the high-WPA mark. Again it was on a two-run home run, though this one gave the Cubs a lead in the third. Montanez hit it right over the 368 sign and gave the Cubs hope of not getting swept. Their hope was crushed in the fifth, however, when the Giants scored five times on six hits, five of which were singles. Barry Zito: 7 IP, 4 H, 2 R, 2 BB, 3 K. That’s a nice way to announce your activation from the disabled list. Cody Ross: 2 for 4, 1 2B. 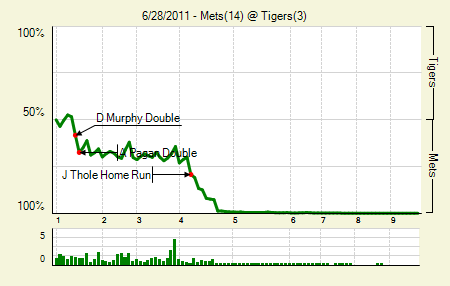 Moving the Needle: Daniel Murphy’s double opens the scoring, +.099 WPA. The Mets got off to a hot start against Rick Porcello, picking up two in the first. Both RBI came on doubles, the first of which Murphy hit, scoring Jose Reyes. Angel Pagan followed that with his double, putting the Mets up 2-0. They struck big in the fourth, putting up seven runs that started with a Josh Thole home run and ended with a Jason Bay grand slam. And you’d better believe selfish Beltran homered after the Mets went up big. Jose Reyes: 4 for 4, 1 2B, 1 3B, 1 BB. He scored three of the four times he reached base, just like they drew it up. Angel Pagan: 2 for 3, 1 2B, 2 BB. The power has definitely been lacking this year. That was just his sixth double, raising his ISO to 100 (.144 career). Moving the Needle: Luke Hughes breaks the tie with a two-run homer, +.259 WPA. Both teams emptied the tank early, scoring all 10 runs in the first five innings. The Dodgers struck in the top of the fifth, scoring three runs to tie the game at four. Then, with two outs in the bottom half, the Twins got a single and then the Hughes homer, putting them up 6-4 and in position to win. After Monday’s game in which they were blown out, the Twins rebounded nicely. Ben Revere: 2 for 3, 1 BB. They were all singles, yes, but he did score twice and drive in a run. 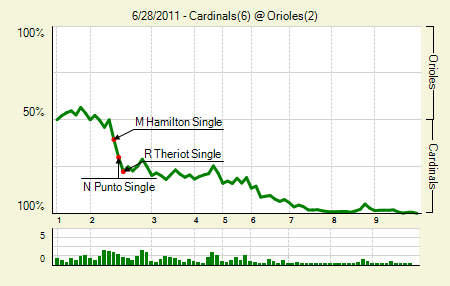 Moving the Needle: Ty Wigginton mercifully ends it in the 13th, +.428 WPA. The first indication that something’s amiss here comes when you look at the play-by-play. It’s not so much the part where “Ty Wigginton singled to center (Fliner (Fly)); Troy Tulowitzki scored.” It’s more the part where Tulo scored from first. Wigginton’s hit was just a flare that landed between the second baseman and center fielder. But Tulo was busting it from the moment the ball hit the bat — you can see him on his way to third before the ball even lands. That’s some big-time hustle, and it won the Rockies the game. Jason Hammel: 7 IP, 6 H, 2 R, 2 BB, 0 K. Notable as much for the seven-inning, two-run performance as it is for the zero strikeouts. Gavin Floyd: 7 IP, 6 H, 2 R, 2 BB, 0 K. OK, so that makes both lines all the more notable. Juan Pierre: 3 for 6, 1 2B. Just because I’ve spent so much time ripping the guy in the last week. Moving the Needle: Curtis Granderson, erm, triples, I guess, +.129 WPA. In the box score it goes down as an RBI triple that opened the scoring and set up another run as well. On video, well, it’s not quite that simple. Nyjer Morgan fell down while tracking Granderson’s fly, and the ball landed just beyond his mitt. Around came Brett Gardner from first, scoring the game’s first run. 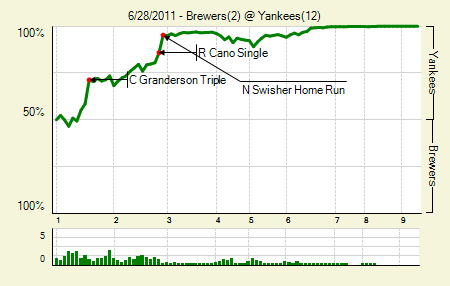 Granderson later scored on a ground out. I’d say that’s why Zack Greinke’s ERA is so much worse than his FIP, but he got tattooed in the second — legit — and came out of the game having given up seven runs in two innings. Nick Swisher: 2 for 4, 1 2B, 1 HR, 1 BB. He’s hitting .320/.444/.649 since May 27th. Mark Teixeira: 1 for 5, 1 HR. He drove in four, but just two with the homer. Two of those outs plated runs. 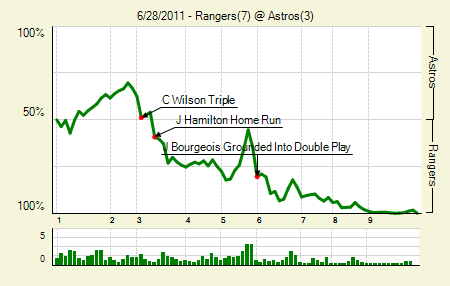 Moving the Needle: Josh Hamilton’s homer puts the Rangers on top, +.133 WPA. The Astros scratched across a run in the top of the first, but the Rangers answered them in the third with three of their own. C.J. Wilson started the inning with a triple — quick, when was the last time an AL pitcher hit a triple? — and scored on a ground out. Josh Hamitlon then blasted a homer, putting the Rangers up 2-1. They got one more that inning before extending their lead with a pair in the sixth. Two late-inning solo homers capped the scoring for the Rangers. C.J. Wilson: 7 IP, 7 H, 2 R, 2 BB, 3 K. The triple makes up for the lack of Ks, right? Ian Kinsler: 2 for 3, 1 3B, 1 HR. The only out he made was a groundout that scored a run. He drove in three total. 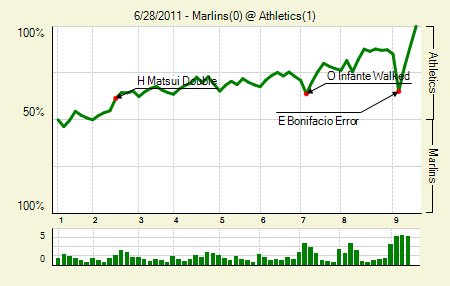 Moving the Needle: Scott Sizemore’s error gives the Marlins a chance in the ninth, -.200 WPA. That’s a serious WPA swing for a play that didn’t involve a run. But it was to lead off the ninth in a 1-0 game, so it was particularly meaningful. I did not see the play — there is no highlight and the condensed game is not posted (at least for mobile devices) — so I cannot speak to the degree of egregiousness. All I do know is that Andrew Bailey bailed out Sizemore by striking out the next three guys to end it. Gio Gonzalez: 8 IP, 1 H, 0 R, 3 BB, 9 K. The only hit was the first batter of the game. Javier Vazquez: 7 IP, 3 H, 1 R, 0 BB, 5 K. That’s only three runs allowed in his last three starts. Moving the Needle: Domonic Brown opens the scoring with a two-run shot in the second, +.193 WPA. 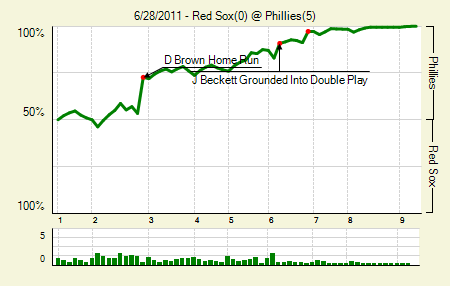 Josh Beckett left one waist high out over the plate, and Brown did what any rising star would do with it. Out of Citizen’s Bank Park it went, giving the Phillies a 2-0 lead. They’d add to the lead later, but it wasn’t quite necessary. They had some dude on the mound who likes to pitch complete games. Cliff Lee: 9 IP, 2 H, 0 R, 2 BB, 5 K. He didn’t allow a hit until the sixth, and ended up killing two of the four base runners via the GIDP. Oh, and he had an RBI on a sac fly, too. That’s three straight complete game shutouts. The longest streak in history is six, which Don Drysdale did in 1968. The last person to pitch three straight shutouts was Brandon Webb in 2007. Roger Clemens is the only other pitcher to do it since the 1994 strike. Moving the Needle: Brian McCann breaks the tie and caps the rally in the seventh, +.317 WPA. The Mariners jumped out to an early lead, and with Michael Pineda on the mound that’s a good sign. But he wasn’t his sharpest as he got into the later innings. 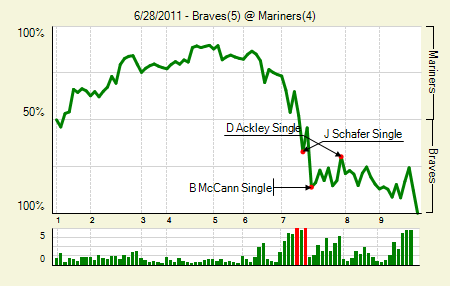 The Braves climbed back into it, scoring once in the fifth and once in the sixth before taking the lead in the seventh. 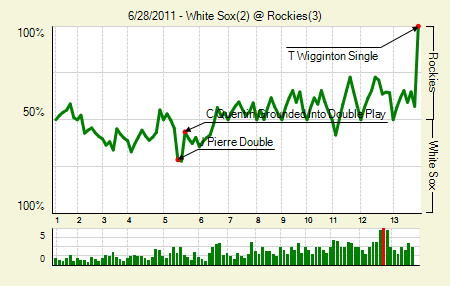 The rally started with a pair of walks, and then a third walk (after an out) loaded the bases. That was it for Pineda, but Jordan Schafer and McCann made sure that those runners all got around. So Pineda gets tagged with three more runs, while Aaron Laffey, the guy who gave up the big hits, walks away with 0 ER. Gotta love how baseball is scored sometimes. Brian McCann: 4 for 5. They were all singles, yes, but four hits is four hits. Moving the Needle: Kyle Phillips singles home a go-ahead run, +.141 WPA. Why a go-ahead run and not the go-ahead run? Because it came in the second inning, and it feels silly to refer to anything with the definite article so early in a game. 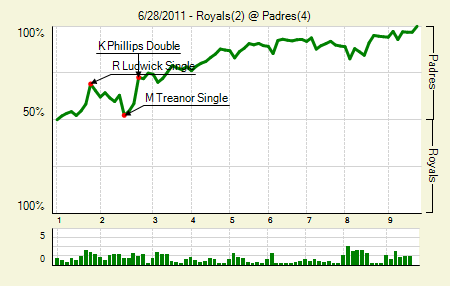 With the score tied at once Cameron Maybin led off with a single, and then came around to score on Phillips’s double. A sacrifice and a sac fly put the Pads up 3-1. Cameron Maybin: 3 for 3, 1 2B. Clayton Richard: 7 IP, 5 H, 2 R, 1 BB, 5 K.
Moving the Needle: Yunel Escobar’s double sets up the Jays in the seventh, +.213 WPA. In a game where the losing team homered four times and the winning team did twice, it was a setup play that garnered the high WPA mark. Not that it wasn’t important. 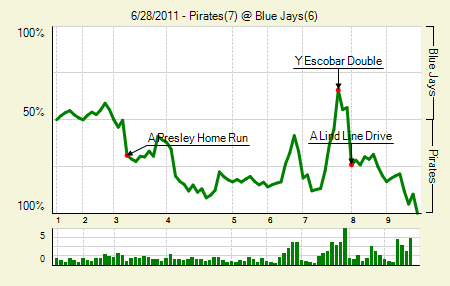 The Jays were down 7-6 after two solo homers to lead off the inning, so they were thinking rally. It almost happened, too, but Adam Lind lined one right to Lyle Overbay at first for an easy double play. A couple of inches and the Jays take the lead there. Alex Presley: 2 for 5, 1 HR. That is his first career bomb, and it put the Pirates up 2-0. He drove in three from the leadoff spot, which is impressive as well. Matt Diaz: 3 for 4, 1 3B. The lefty wasn’t long for the game, but he stayed in and did his thing. Edwin Encarnacion: 2 for 4, 2 HR. They were both solo shots. We hoped you liked reading The Morning After: Game Recaps for June 28th by Joe Pawlikowski! Selfish Beltran stealing Bay’s grand slam thunder with his own grand slam.